Silk makes a lot of lofty promises on its packaging. The carton emphasizes that Silk is a trustworthy, honest company and guarantees that if you don’t love the product, you’ll get your money back. Ingredients, they say, are “grown responsibly, and… as close to nature” as possible. No artificial colors, flavors, high-fructose corn syrup, dairy, or GMO. To back up that last one, it displays a label that reads “Non-GMO Project Verified”. It also provides a web address where you can track where the soybeans came from (North America) at SilkSoymilk.com/TraceIt. I followed this link to their website to have a look around. In fact, Silk seems to do a pretty nice job of backing up their claims. In the Our Story section, you have the option to read about Silk’s commitments to Non-GMO ingredients, resource and water conservation, and recycling. They partner with several seemingly respectable organizations, and provide links. These partners include The Non-GMO Project, Change the Course Colorado River Restoration Project, Carton Council, Bonneville Environmental Foundation, and four others. Following these links, I’m taken to organization websites that, for all intents and purposes, seem to be perfectly credible. Back on Silk’s website, they explain their involvement with these partners and reference actual reports published by the USDA as well as assessments of their Life Cycle and Water Footprint. I’m impressed with their transparency. I can’t positively identify any of the Seven Sins of Greenwashing. They make specific claims, and then back them up; they do a good job of explaining why they make the environmental choices they do, which eliminates any worry of irrelevance; their Non-GMO label is backed by an actual project which allows consumers to make informed decisions. I guess I have no way of knowing whether there are hidden trade offs or fibs without doing a much more in depth study of the company and their practices. But they seem to have a pretty comprehensive view of sustainability, focusing on water, recycling, resource conservation, and non-GMOs, so I feel safe believing that there are no hidden trade offs, and have no reason to believe they are lying about anything. I give Silk an A+. There is no direct web address listed anywhere on the packaging, but Meijer is a well-known company in Michigan, so I just googled “Meijer Naturals” and arrived at their “Brands” page. This was a big disappointment. Basically, this page just lists the names of their different product lines: Meijer, Gold, Organics, Naturals, EcoWise, Elements. These logos do not seem to be clickable, so I can’t learn about the individual product lines or what sets them apart. Specialty brands? That’s all I get? You haven’t even made a claim as to what specific needs your product is possibly addressing…. Nor have you compared any data with that of “comparable national brands”. 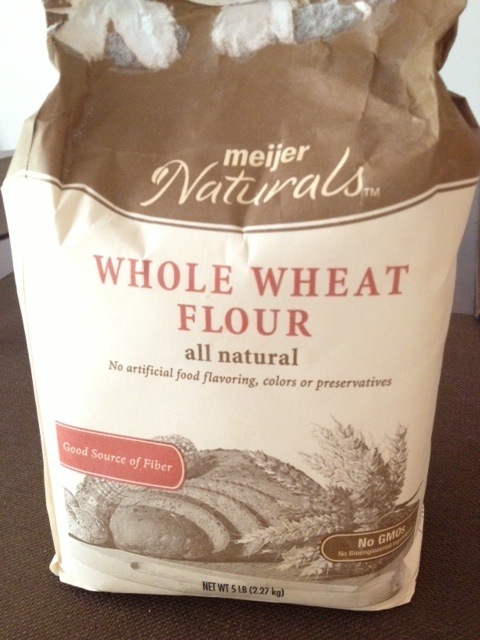 Definitely Meijer is committing the sin of no proof, and likely others as well (“Naturals” – vagueness! Their own non-GMO label – maybe a false label? Fibbing?) After seeing this rather sparse website, I have little reason to believe the truthfulness of their claims. I give Meijer and all their brands a big fat F! I was a little surprised at how vague Meijer’s website was in that they don’t even try to define their different product lines or why they make them. I expected at least some jargony differentiation between their Organics, Naturals, and EcoWise lines. However, I did expect Meijer to be less environmentally conscious than Silk. I’ve always been under the impression that Silk was a fairly “green” company – mostly because of their packaging and their “Love it or Your Money Back!” promises. My research today confirmed this. I can’t say, though, that I wasn’t disappointed to learn how exaggerated Meijer’s claims were. Do you have any greenwashed labels in your kitchen? I’d love to hear from you! Tell me what you find out in the comments below. You open the fridge. Empty. It’s clearly time to hit up the local grocery store. You make plans to stop after work so that you have something to eat for supper. 5:00 PM. You get in your car, drive to the store. You’re standing in the aisle, considering your options: black beans. Brand A is cheapest, but Brand B says “Organic” on the label. You consider yourself an environmentally-conscious person, so you choose the Brand B black beans. The term greenwashing was coined by an environmentalist named Jay Westervelt in a 1986 essay about the hotel industry’s practice of encouraging re-use of towels and sheets. You know, the placards that read “If you’d like new towels, please leave your used towels on the floor” ? Jay Westervelt felt that these placards were a load of crap, and he published his essay about the fact that while hotels were painting themselves as “eco-friendly”, their ulterior motive was really just to save money on the laundry. 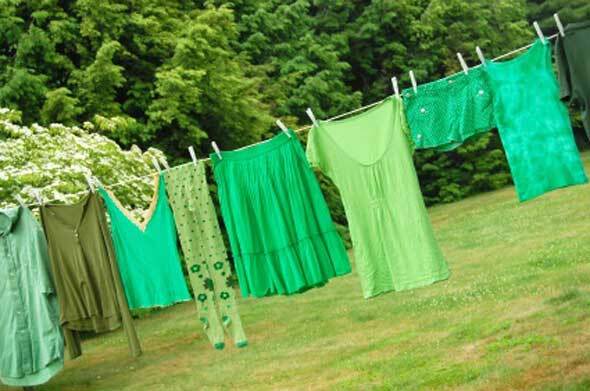 Greenwashing is essentially a marketing strategy – and a growing one. We’ve all seen it: it’s when a company engages in “green talk” – the language they use to inform consumers of their environment-conscious initiative – but doesn’t walk the “green walk”, or follow through on their claims. Sin of the hidden trade-off: committed by suggesting a product is “green” based on an unreasonably narrow set of attributes without attention to other important environmental issues (for example, paper produced from a sustainably harvested forest may still yield significant energy and pollution costs). Sin of no proof: committed by an environmental claim that cannot be substantiated by easily accessible supporting information or by a reliable third-party certification (example: paper products that claim various percentages of post-consumer recycled content without providing any evidence). Sin of vagueness: committed by every claim that is so poorly defined or broad that its real meaning is likely to be misunderstood by the consumer (“all-natural” is a common one). 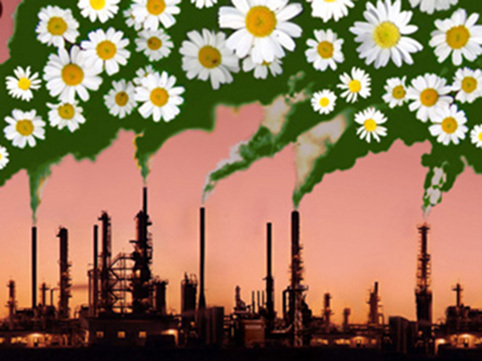 Sin of irrelevance: committed by making an environmental claim that may be truthful, but is unimportant or unhelpful for consumers seeking environmentally preferable products (for example, “CFC-free” is meaningless given that chlorofluorocarbons are already banned by law). Sin of less of two evils: committed by claims that may be true within the product category, but that risk distracting the consumer from the greater health or environmental impacts of the category as a whole (example: organic cigarettes). Sin of fibbing: committed by making environmental claims that are simply false (as in products falsely claiming to be Energy Star Certified). Sin of false labels: committed by exploiting consumers’ demand for third-party certification with fake labels or claims of third-party endorsement (by using certification-like images with green jargon such as “ego-preferred”). So – do you really know what you’re buying? To find out, it could take some research. 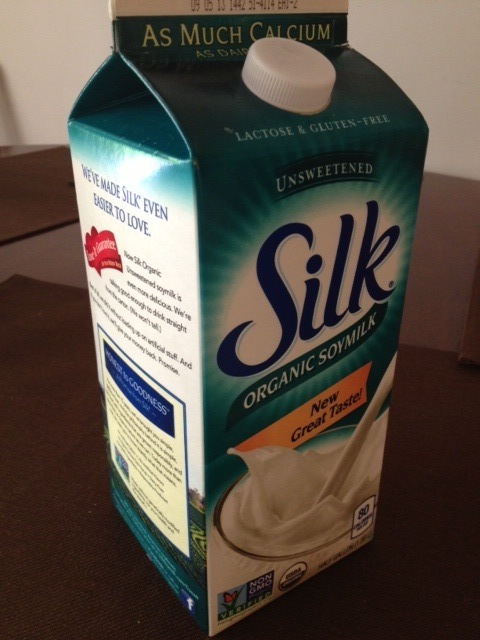 In my next post I’ll explore two products found in my own kitchen that carry green labels. Stay tuned! It’s a question we’re going to ask ourselves a lot in the coming years: how on Earth (literally) are we going to continue to feed our rapidly-growing global population? The goals are these: to end world hunger, to double food production by 2050, and to achieve both while at the same time drastically reducing the damage conventional agriculture does to our environment and climate. Dr. Jonathan Foley, Director of the Institute of the Environment at the University of Minnesota, has five very persuasive and practical ideas on how we can increase the world’s food output to better feed the globe. Stop expanding agriculture’s footprint. It’s been shown over and over that we can feed an additional four billion from the world’s existing cropland – the problem of not having enough food arises because of yield gaps and food waste. Expanding agricultural efforts into already threatened tropical forests and savannas results in increased carbon emissions and loss of biodiversity. These valuable habitats can be preserved by seeking alternative sources for biofuel (such as non-edible switchgrass instead of corn) and investing in programs such as the Reducing Emissions from Deforestation and Degradation program (REDD). Close the world’s yield gaps. Rather than helping already high-yield farms raise their “yield ceiling”, we would be smarter to invest in helping low-yield farmers close their yield gaps. What we do today is more like providing the “A” student with a tutor instead of the “C” student who, with help, would likely achieve significantly greater academic improvement than the A student would. Foley’s research team sees opportunity for higher potential yields in regions across Africa, Central America and eastern Europe by planting with better seeds, applying fertilizer more effectively and irrigating more efficiently. Some of these methods would require educating farmers on best practices for their regions, but once adapted, would gain immediate returns. Use resources more efficiently. For example, using a drip-irrigation method that hydrates plants near their roots, rather than spraying droplets in the air, would significantly curb water waste. Similarly, some areas of the world are more nutrient deficient than others, and would need more fertilizer accordingly. However, most farmers either use too much fertilizer, leading to pollution, or too little, leading to poor crops. “Almost no one uses fertilizers ‘just right’,” says Foley. Actions that would fix this excess of resource use are policy and economic incentives that would reward farmers for watershed stewardship, improved manure management, environmental protection, and nutrient recycling programs. Shift diets away from meat. This one has been covered over and over. Foley writes that “globally, humans could net up to three quadrillion additional calories every year… by switching to all-plant diets.” Even small shifts in diet – toward poultry and away from beef, or adopting Meatless Mondays, for example – would make significant differences. Reduce food waste. Roughly 30 percent of food produced worldwide is lost to pests and spoilage, or is simply discarded. In wealthy countries, much of this waste takes place on the consumer end – in restaurants and in the backs of our refrigerators (yes, I’m guilty, too.) Smaller portion sizes could help in this respect – less food cooked and wasted. (The added bonus would be our reduced waistlines.) In poorer countries, losses take place at the producer end – more failed crops, food ruined by pests, or simply poor infrastructure that fails to deliver food before spoilage. Improved storage, refrigeration and distribution would serve to cut waste. Foley recommends these strategies not as a silver bullet, but “silver buckshot”. I agree with him in that there is no one method that will save our planet and ourselves. But it’s a big job ahead of us, and we need to begin right away if we are to reach our goals before 2050. Am I optimistic that we could make significant strides toward greater sustainability and production? Yes. Foley’s research gives me hope that it is possible. Whether it’s probable, however, I’m not sure. The changes Foley suggests are practical and concrete, but underlying them are assumptions of a wider cultural shift in favor of sustainability – and culture is generally slow to change unless provoked by major catastrophic events. I don’t really believe that we will win the Green Food Revolution on the basis of a green revolution; we need to bring the worldwide conversation to a point where economics and social strategy can meet. “Saving the Planet,” for most people, isn’t incentive enough to make any changes beyond recycling, or carrying cloth shopping bags. What we need is government action. Environmental policy. Economic incentives for farmers to do better. But in the end, it isn’t even really about saving the planet – it’s about saving ourselves. It won’t be easy. We’ll either choose to start now – or we’ll be forced to. I’m afraid that if we wait for the latter, it will be too late. 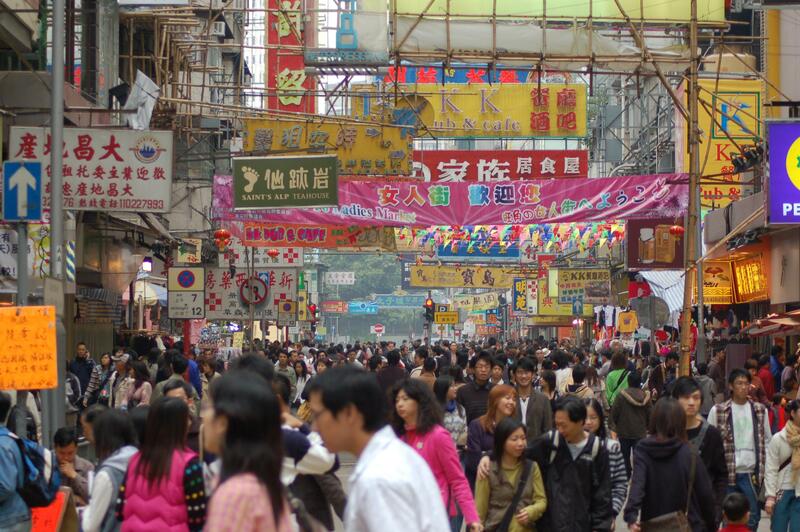 Environmental, agricultural, and climate thinkers the world over keep moaning about the “population problem.” What many people fail to recognize, however, are the consumption habits of our worldwide population. With a global population of over 7 billion and growing daily (and exponentially), consumption is arguably what the population problem is about: how can our Earth continue to support all those people? How can we expect to feed more people, even while we face rising food shortages due to increased global temperatures? It is widely accepted that climate change is a direct result of human activity, and that agriculture is a major contributor – accounting for as much as 25% of humanity’s greenhouse gas emissions. Many farmers, however, deny their role in climate change, and understandably so: to acknowledge climate change would be to incriminate themselves and disparage their very livelihoods. Beyond that, the solutions to mitigating climate change are complex, and would require a drastic upheaval of agricultural method as we know it. Even though vegetarian and vegan diets have been shown to leave a greatly reduced carbon footprint, it may not be reasonable to ask the world to radically change their diets to procure food from only plant-based sources. However, we must recognize that while we are clearing vast swaths of forest in the Amazon to make room for ever more farms and livestock, we are also leaving an indelible mark on the surface of our planet. What can be done? Fortunately, there are a few people that have begun to theorize on how we can use agricultural technology that already exists to reduce, and perhaps even reverse the effects of climate change. Advocating for low-till or no-till farming. Many farmers are already trying this method of planting seeds. While plowing, the traditional method of planting, releases carbon into the atmosphere, low- or no-till farming means that farmers plant seeds by using a small drill, leaving the soil largely undisturbed, keeping carbon sequestered in the soil. Reverting to the Earth’s natural systems: photosynthesis and grazing, or “bio-mimicry”. Pollan believes that plants and animals can work together to achieve natural carbon sequestration via photosynthesis. Plants convert the sun’s energy into plant growth – leaves and roots. When a ruminant (a cow) comes along and grazes the grassland, it trims the plant down to roughly 2-3 inches. The plant will respond to this by killing off a portion of it’s root system equal to that of the lost leaf and stem. Discarded root matter is then used by underground organisms (earthworms, nematodes, etc) to turn the carbon in the roots back into soil. Note that this requires meat to be naturally grazed, grain-fed and free-range; stricter policy against greenwashing would need to be implemented in order to assure consumers of this low-carbon footprint method of raising meat and restoring soil carbon. Helping farmers deal with weather variability, whether they believe that “climate change” is the cause or not. Regardless of what a farmer may say he believes about climate change, chances are he is already using some “green” methods – like reducing tillage to keep soil from blowing away during dry spells. Helping farmers improve their farms’ productivity will encourage climate adaptation. Encouraging crop diversity. Moving away from a monocultural model of farming, while encouraging a mix of small, rotating crops, will help prevent the spreading geographical range in which pests can thrive, and will also restore nutrients to the soil, reducing the need for chemical fertilizers. Fostering an arena for open-source genetic modification. While some people are quick to denounce GMO food products, there is little hard evidence that they the anathema that many make them out to be. In a world plagued by a warming worldwide temperatures, increasingly inclement weather, and spreading pathogens, we need our agriculture to be innovative. We need GMOs to be able to produce more food on less land. But why leave it in the hands of mega-corporations like Monsanto? The genetic map of rice is already available publicly. Why not allow public access to further crops – cassava, millet, or teff – crops which, if genetically modified, could provide huge opportunities for the world’s poor? It’s true that we will not be able to continue eating and growing food forever as we do today; our planet will give out before too long. But if we apply innovative thinking, and realize the reinvention of old technologies, we may begin to see some proposed solutions come to fruition. It really has been awhile since my last post – a month! Truly I haven’t meant to be away for so long… and I’ve been up to so many things! Recently I’ve been looking at what the world eats, and what sustainability means in those many different places. I discovered the FAOSTAT, a unique tool introduced by the Food and Agriculture Organization of the United Nations (my nerdy-foodie-anthropologist-junkie self loves this – it can tell me about food all over the world!) I’ve been thinking about the impact of globalization and how farming practices and foreign policy in one country affect families in countries half the world away. I’ve been thinking about the growing population problem, and what it means that our planet will soon need to feed 9 billion people. And, in thinking about the strain that kind of food production could put on our Earth, I began to explore what can be done about global food waste. So you can see I’ve been busy. And I want to think hard on all of those topics and perhaps discuss them here later. Today though, I decided to take a deep look at just one meal. I wondered, what does it take to produce an average meal? Where does my food come from? How much energy and water is used to produce it? What happens to my kitchen waste? It’s by no means a comprehensive study, but here’s what I learned. For dinner tonight we decided to use up a bunch of produce we had in our fridge – we tend not to eat it up FAST enough and it sometimes goes bad before we get to it (read: consumer-level food waste!) Stir frying is usually a good way to throw a variety of veggies together. I’d also been wanting to try my hand at making mango lassis and had recently bought the ingredients, so I made that as well. Lemon juice, yogurt – distributed by Grand Rapids, MI company, but growing area unknown. When/how our food was grown: The kale, green onion and zucchini were grown within the last 2-3 weeks – we get them in our CSA basket, which comes from a transitional-organic mixed-crop farm at a local university. The mint was picked fresh off a plant in our backyard. For everything else, the “when” and “how” are unknown. 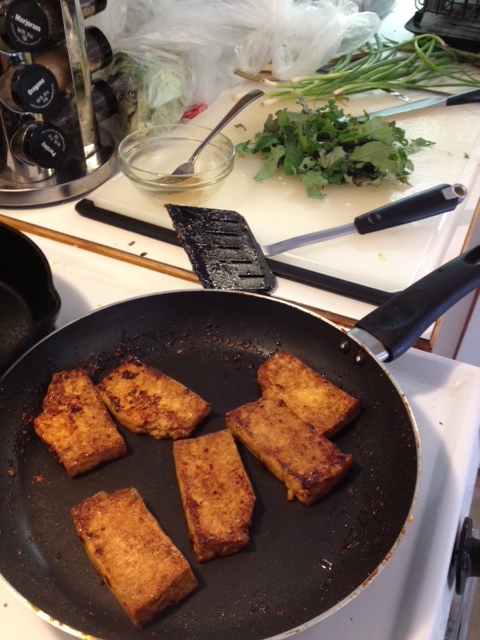 Processing for our meal: Tofu was seared, then tossed with other chopped/diced vegetables in a wok. Marinade ingredients were mixed and then tossed in the wok also. Water was added to rice to cook in a rice cooker. 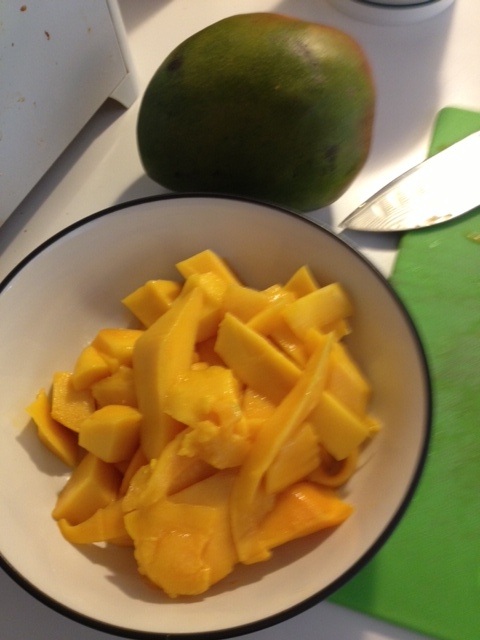 Mango was cut off the pit, turned into pulp with a blender, then blended further with yogurt, honey, cardamom and salt. Transportation/Distribution: Our meal was both very local and very foreign! Ingredients came from as close as our backyard, across our country, and from as far away as Asia and South America. I’m sure it got to us via as many kinds of transportation as you can imagine – my best guess would be by truck and by air. I can’t know for sure about any of them except those grown through our CSA program – those get trucked to the produce stand directly from harvest, and then we pick it up and bring it home in our car. Acquisition: All but the mint was purchased either from the CSA farm or one of our local grocery stores. Packaging and storage: Fresh produce from the CSA comes in a basket. Fresh produce in the store is usually not packaged until we bag and purchase it. Sesame oil and soy sauce are in glass bottles; red pepper flakes, lemon juice, cornstarch, and yogurt came in plastic containers; cardamom pods came in a plastic bag. We store the perishables in our refrigerator and everything else in cupboards/cabinet. Preparation: Veggies were washed under running water, rice was cooked with water (2 cups), and we periodically rinsed our hands – rough water estimate about a gallon, maybe more. For utensils we used knives, cutting boards, blender, wok, nonstick Teflon pan, spatula, and a wooden spoon. Stir fry was cooked over a gas stove; lassi was blended using an electric blender. Total cook time was about an hour if you estimate 20 minutes searing the tofu, 20 minutes stir-frying veggies, and 20 minutes cooking the rice. Our kitchen: Our kitchen is average-sized for an apartment – open floor space where our table is but not very much counter space. It’s lit mostly with energy-efficient CFL bulbs except for one fluorescent bulb over our sink. Our home is heated with gas (in the winter – not right now) and a nearby nuclear power plant supplies our electricity. Cleaning/Disposal: Utensils and dishes will be hand washed in the sink. We usually wipe up after cooking with a damp towel – may use a cleaning agent if we need to scrub areas of our stove. Packaging from food goes mostly in the trash as we do not have a recycling service in our area (I really wish we did – throwing away perfectly recyclable plastic and cardboard pains me every time). All organic waste ends up in our compost. Sewage from our home goes to a septic tank. This was a fascinating study of my meal. One of the most surprising things I learned was all the countries represented within my own kitchen. I do try to buy as locally as possible – which works here in southwest Michigan in the summer, because being next to the lake means our climate and growing region are second only to California in terms of productivity and variety! But when I stop to think about it – well, of course, where else would I get rice but from Asia? Where did I expect the mango to come from? Most surprising was the honey – from Argentina?! That’s one I know I can do better on – I know I can get local honey, and I’ll pay attention to that the next time I buy some. This is our second year participating in the CSA program. We get a fresh basket of locally-grown produce every week. Last year we found ourselves with abundances of certain veggies that we just couldn’t eat fast enough – yellow and jalepeno peppers, cucumbers, cabbage, etc. Often they would rot in our fridge. Part of it was that we didn’t know what to do with them in such quantities. 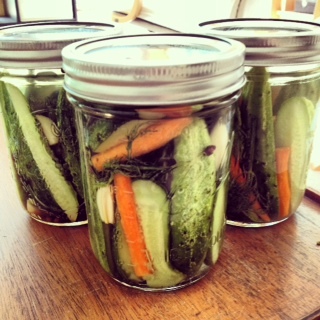 This year I’ve been reading about the processes of fermenting vegetables, and I’m hoping to reduce our food waste by using fermentation as a preservation method. 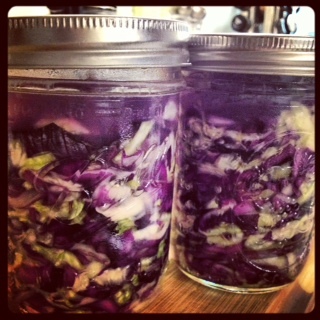 I just made my first batches of sauerkraut and pickles! We’ll see how they turn out! Every day, we drove past them: acres upon acres of dry corn, blackened by the summer sun, withering where it stood. Summer of 2012 was a hot one, and our farming neighbors in rural southwest Michigan were feeling the heat. Michigan lost much of its harvest last year – our cherries and apples, corn and soybeans. It was an unusual growing season in that it started out hot – too hot, for March. The early warmth of spring tricked the fruit trees into thinking it was summer; they began to bud and blossom. And then out of nowhere, it seemed, frost descended and killed the crops before they even had a chance; our harvest was effectively “nipped in the bud”. The early heat and freeze, followed by an intensely dry summer, prompted the USDA to declare the whole state – all 83 counties – a natural disaster area due to heat and drought. The hardship was familiar to farmers across the Midwest. In fact, in late July of 2012, the USDA “designated 1,369 counties across 31 states as disaster areas… making all qualified farm operators in the areas eligible for low-interest emergency loans”. It was estimated that two-thirds of the entire country were experiencing drought. Scientists and climatologists tell us that such extreme weather may increasingly be the “new norm”. At the 2013 Colorado Farm Show in Greeley, Colorado, Nolan Doeskan, the State Climatologist, told a sobered group of farmers that “if the computer models are anything close to right… 2012 will be an average year in just a few decades”. While many laypeople – about half the American public – say they don’t believe in global warming, in fact 97% of scientists agree that it is happening, and that it is caused by humans. Whether or not we choose to believe in climate change, the fact remains that we see extreme weather events occurring at increasing rates across our country. Whether hurricanes, tornadoes, drought and other weather events of heightened severity are attributed to global warming, or simply natural fluxes in historical weather patterns – they are happening at an unprecedented rate, and they affect our food security and our economy. The complexity of our food system is incredibly sensitive to changes in weather patterns: heightened levels of CO2 contribute to these ever more frequent “freak” storms and droughts. Warmer temperatures also invite invasive pests and disease, cause plants to grow faster than the time needed for maturation, and reduce the ability of land to produce adequate amounts feed for livestock. The harm in adamantly denying there is change is that if we continue to do “business as usual,” we risk our very homes and livelihoods. Our inability to adapt and seek mitigation will cost us in terms of our economy and well-being, as we see food grow scarce and prices continue to rise. If we hope to find solutions, we need to pay attention to climate change now. Climate change skeptics sometimes defend greater CO2 levels in the atmosphere. In an op-ed published by the Wall Street Journal last month, scientists and known skeptics Harrison Schmitt and William Happer argued that “increased carbon dioxide in the atmosphere will benefit the increasing population on the planet by increasing agricultural productivity.” While it’s true that CO2 is a natural atmospheric gas and that it does contribute to accelerated growth, it is possible to have too much of a good thing. What Schmitt and Happer fail to acknowledge are the detrimental effects of higher CO2 to human agriculture and, more generally, our planet’s natural ecosystems. These adverse effects far outweigh any potential benefits. The EPA states that while moderate warming and more carbon dioxide may be a boon to plant life in the short term, “more severe warming, floods and drought may reduce yields” over time. This is how: while human agriculture may experience accelerated growth, so will weeds. Warmer temperatures will also create optimal conditions for insects and fungi to flourish. As our planet warms, problematic weeds, pests and disease common to southern tropical or subtropical areas will see a growing geographical range in which they can thrive. This poses new problems for farmers who must quickly learn alternate weed management strategies and invest greater time and energy in protecting their crops from invasive species. According to the USDA’s February report on climate change and agriculture in the United States, agricultural crops are heavily dependent on a complex set of interactions between temperature, CO2 levels, solar radiation and precipitation. Temperature thresholds specific to individual crops determine the plants’ growth and reproduction. With higher temperatures plants may grow faster but smaller if they do not simultaneously receive the required water or soil nutrients for maximum yield. Moreover, because agriculture depends so heavily and fundamentally on a stable climate, the timing of plant maturation with the lifecycles of pollinating insects has an effect on crop output. All of these factors together inflict hardship on food producers; they spend more time, energy, and money contending with weeds, pests, and diseases that threaten their crops. In dry areas and when water is scarce, fields require heavier irrigation. Much of the country relies on groundwater to supply irrigation systems; with a long enough drought, the absence of rainfall may inhibit groundwater recharge. But reduced crop yields are problematic not just for the farmers that grow them; it also hurts consumers’ wallets. As a result of last year’s drought, the US is seeing inflated food prices. Dairy, eggs, beef, poultry and pork prices are driven up because animal feed is scarcer. Food insecurity will force the US to rely on feed and produce exports from abroad – meaning that food is more expensive, and uses more fossil fuels to reach us. The drought last year cost our government, too: in August 2012 the USDA authorized a combined total of $30 million in emergency assistance for “moving water to livestock in need, providing emergency forage for livestock, and rehabilitating lands severely impacted by the drought.” Climate change has a very real effect on our economy. There are solutions, if we act now. Citizens can write to their legislators to advocate for more investment in wind and solar energy, and less coal mining and fossil fuels, which contribute heavily to atmospheric warming. 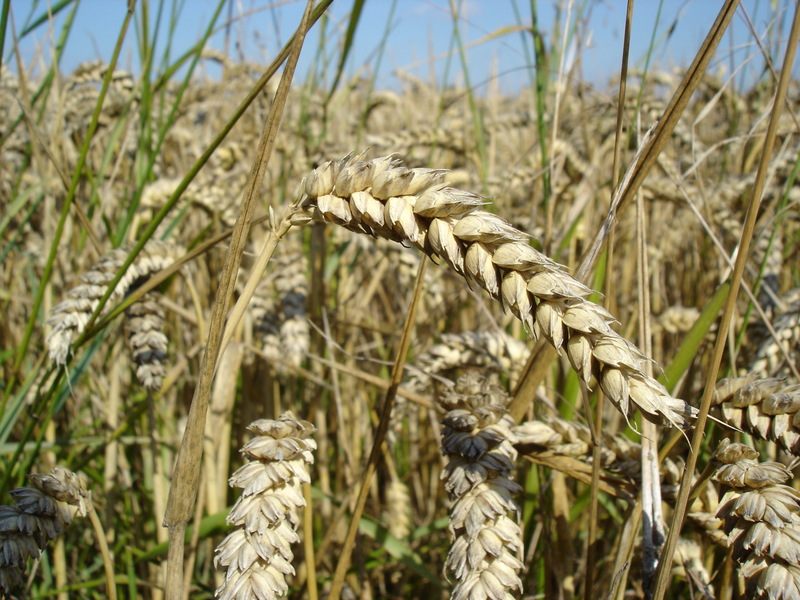 Support research for agricultural adaptation methods and greater fuel efficiency standards. Eat less meat. Seek out sustainable, closed-loop food systems, or better yet, learn to grow your own food. Reduced food security and food sovereignty do not need to be “the new norm.” But before we can have any hope of stopping climate change, we’ll have to make some changes ourselves. One of the reasons I love Slate is their opinion blogs, where one author writes an article, and a few days later, another writes an article as a direct response, often calling the other out. It’s a lot like eavesdropping on a conversation – usually a well-researched one. Last week I read one written by Anne Weaver, imploring me to “Give Spam a Chance”. I was largely unconvinced, but I chalked it up to a thought experiment. (Go, me!) Days later, Ted Genoways responded with “Spam’s Shame”. Being the info junkie that I am, I clicked several of the links he used as reference in his article, and was led to an in-depth story about the Spam factory in Austin, Minnesota (also written by Genoways). My interests in the food and meat industries are precisely this: our diets have great implications on the lives of others. MY diet affects others’ – their health, their socioeconomic status, their environment. The argument “why do you care what I eat?” just doesn’t hold water with me, because it tells me that you don’t really know what’s behind that porkchop on your plate or that Spam in your belly.